Home health Emergency Signs and Symptoms of Appendicitis You Should Know! Appendicitis is the inflammation of the Appendix which is a finger-shaped pouch that projects from your colon on the lower right side of your abdomen. Most common signs and symptoms of appendicitis include sudden pain that begins on the right side of the lower abdomen and spreads, loss of appetite, sudden pain that begins around your navel and often shifts to your lower right abdomen. Pain that worsens if you cough walks or make other sudden movements. 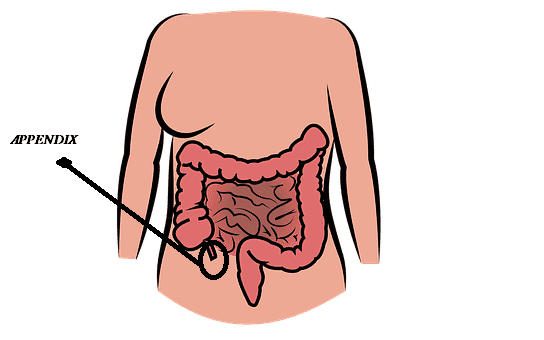 The appendix is the little one ended tube that's attached to the cecum of the large intestine. Sometimes it's called the vermiform appendix, where a vermiform means worm-shaped. so that should paint a pretty clear picture of what it looks like. This odd kind of cute little worm-like structures function is actually unknown. though some theories suggest that it might be a safe house for gut flora. Some evidence seems to suggest that it plays a part in the lymphatic and immune system. Other arguably more cynical viewpoints think that it's just a useless vestigial organ from our ancestors. Whatever the case may be the fact remains that it's pretty talented at getting inflamed and causing abdominal pain, her condition known as appendicitis. Since the appendix is a hollow tube the most common cause of inflammation is something getting stuck in or obstructing that tube like a fecalith. Which is a hardened lump of faecal matter that finds its way into the lumen of the appendix and wedges itself there it could also be other things though like seeds that were digested or even pinworm infections which are intestinal parasites? Another cause of the obstruction especially in children in adolescence is lymphoid follicle growth also known as lymphoid hyperplasia. Lymphoid follicles are dense collections of lymphocytes that get to their maximum size in the appendix during adolescence. Sometimes this growth though can literally obstruct the tube, also when exposed to viral infections like adenovirus measles or even immunizations the immune system ramps up and these follicles can grow as well. Whatever the cause of the obstruction is now the appendix is plugged up. right well, the intestinal lumen including the appendix is always secreting mucus and fluids from its mucosa to keep pathogens from entering the bloodstream and also keep the tissue moist. Even when it's plugged the appendix just keeps secreting as usual, when this happens fluid and mucus build up which increases the pressure in the appendix. and just like when you fill up a water balloon it gets bigger and physically pushes on the fair and visceral nerve fibres in your body causing abdominal pain. Along with that the flora and bacteria in the gut are now trapped. right an intestinal bacteria that are usually kept in check in the gut like Ecoli and Bacteroides fragilis are now free to multiply. This causes the immune system to call up white blood cells and pus starts to accumulate in the appendix. this activation of the immune system can be seen in the lab as an increase in the serum white blood cell count. Patients might also develop a fever in response to the infection which in combination with right lower quadrant abdominal pain at the point roughly where the appendix is known as the McBurney's point is a super important sign for identifying appendicitis. Also along with the fever, other classic symptoms include nausea and vomiting. If that obstruction persists the pressure in the appendix increases even more at a certain point as the pressure keeps going and it continues to swell up. It pushes and compresses the small blood vessels that supply the appendix with blood and oxygen.without oxygen the cells in the walls of the appendix become ischemic and eventually die. Since these cells were responsible for secreting mucus in keeping bacteria out now the growing colony of bacteria can invade the wall of the appendix. As more cells die the ependymal wall becomes weaker and weaker and for a small proportion of patients it gets weaker to the point where the appendix ruptures. Rupture of an infected appendix allows the bacteria to escape the appendix and get into the peritoneum. and patients often experience peritonitis with rebound tenderness meaning pain when pressure is taken off again around the McBurney's point. Patients might also have some abdominal guarding or the abdominal muscles tense up when pressed to try and avoid pain. The most common complication with the ruptured appendix is pus and fluid getting out and forming an abscess around the appendix called the para appt indicial abscess. Sometimes subphrenic abscess is might also form and these would be tiny abscesses below the diaphragm but above the liver or the spleen. The treatment for appendicitis mainly includes surgery before which a dosage of antibiotics needs to give to prevent any kind of infection. This procedure is known as appendectomy it is an open surgery which can either be done by making one long abdominal incision or lay periscopic Li using only a few small incisions. If your appendix has burst and an abscess has formed around it the abscess may be drained by placing a tube through your skin into the abscess. 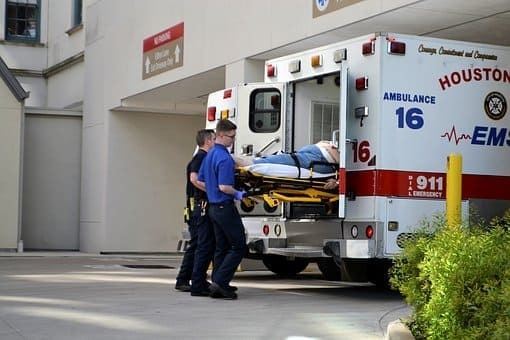 Appendicitis is a medical emergency that requires prompt surgery to remove the appendix left untreated an inflamed appendix will eventually burst or perforate spilling infectious materials into the abdominal cavity. This can lead to peritonitis a serious inflammation of the abdominal cavities lining the peritoneum, that can be fatal unless it is treated quickly with strong antibiotics. The standard treatment for appendicitis is appendectomy which is a surgical remove the appendix along with antibiotics. The patients have abscesses these are also important to surgically drain. removing the appendix isn't known to have any negative side effects and sometimes it's removed if the surgeons are already doing an abdominal surgery for some other reason, just to avoid an appendicitis down the road.